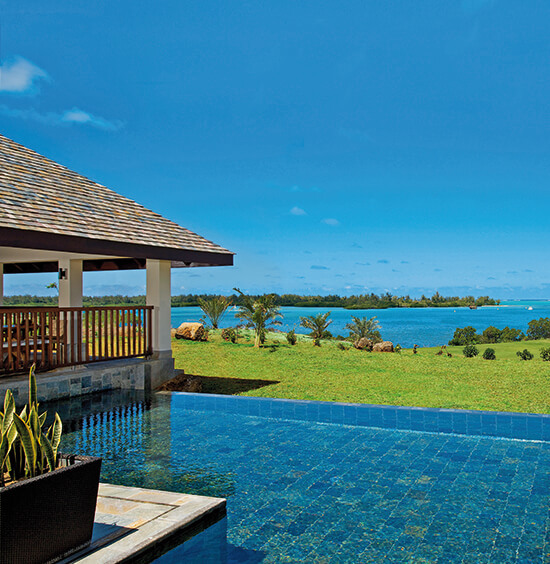 We challenge you not to be captivated by the beauty of this luxurious island hideaway. Here, the 25 cottages feature no keys, televisions or mobile phone reception, so you can enjoy a hard-to-come-by digital detox. Listen instead to the sounds of the lapping waves, watch turtles hatch in season and make time to meet Toby, the oldest tortoise on the island. 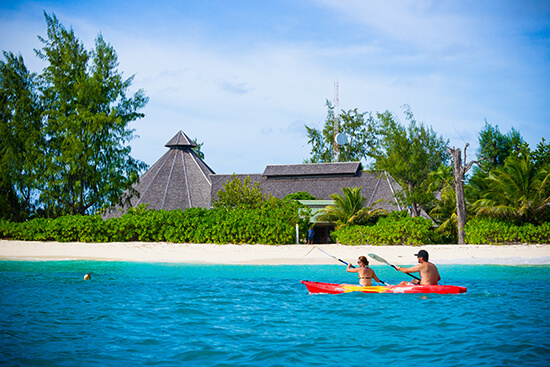 Cycle or canoe around the island, before returning to the hotel for a scoop of your favourite ice cream. Exquisite cuisine is served at the outdoor terrace restaurant, where you are invited to choose from a five-course menu. A real favourite of mine, this adults-only haven has just 67 rooms and prides itself on privacy and tranquil seclusion. It is also just steps from Anse La Raie lagoon, which is one of the top kite-surfing spots on the island; great for beginners and professionals. Go paddleboarding before sinking into a beachside beanbag, and take your pick from four restaurants. XO serves up delicious Asian fusion dishes, and don’t miss a visit to the Rum Gallery, where you can taste some of the island’s top tipples. 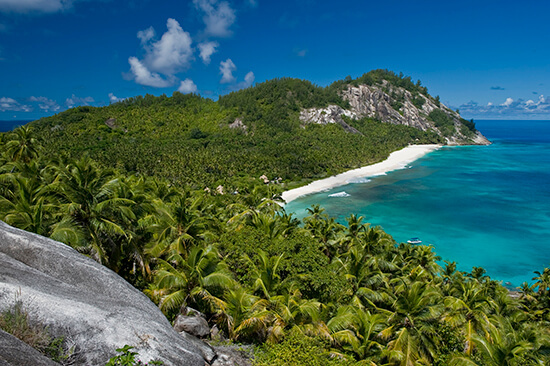 A glistening jewel of the Seychelles, adorned with rich forest and unforgettable beaches, this granite island is the epitome of paradise. With natural tones, bare wood and just 11 elegant, open-plan villas, you will experience complete privacy on this island hideaway. 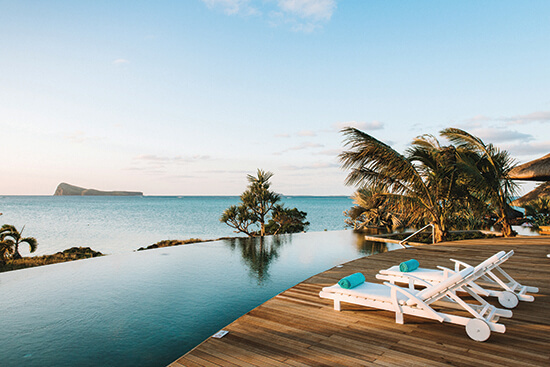 Dedicated to conservation, native flora and fauna flourishes at this resort, where every villa has its own electric buggy to explore the island. And did I mention the dining options yet? A chef will always discuss the menu with you and will effortlessly create your special requests to give you a completely personalised dining experience. Located in the Lhaviyani Atoll and with seven different villa types to choose from, you won’t have to worry about your wallet once during this idyllic getaway. With its own house reef, Kuredu is perfect for ocean lovers, while the Duniye Spa has an overwater section set on stilts. With four restaurants and three a la carte dining spaces, you will never go hungry. Franco’s is a must-visit – the revitalising late breakfasts are divine. With a house reef promising turtles, stingrays and tropical fish, plus a boat trip where you can spot dolphins leaping in the ocean, this resort is an animal lover’s paradise. This family-friendly resort is perfect for younger guests. The OurSpace children’s club and Escape Club for teens both offer plenty of activities, or you can take the family to the QuaySide Boathouse for a snorkelling trip or glass-bottomed boat tour. Nearby natural reserve Domaine de l’Etoile promises a range of fun and games, including one of the world’s longest zip lines. Board the free shuttle boat to the Adventure Park at Ile aux Cerfs, or tee off at one of two 18-hole Championship golf courses. 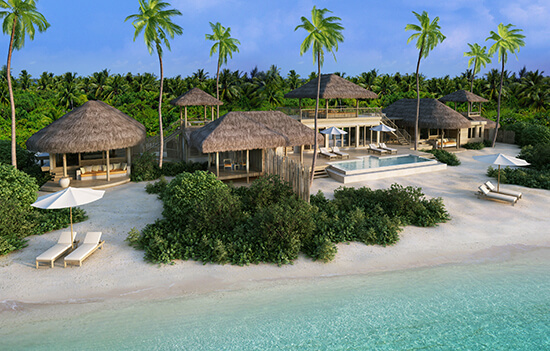 Set among the unspoilt islands of the southern Maldives, the luxurious Six Senses Laamu sits on a remote lagoon where dolphins swim and turtles come to nest. Your beachfront or overwater villa is a stylish sanctuary that gives you privacy while also revealing the island’s natural beauty. My favourites are the Laamu Water Villas, which are set towards the end of the jetties with sunrise and sunset vistas – providing your very own front row seat for the moment the world turns golden. Try windsurfing or wakeboarding if you’re feeling active, or, for a gentler pace, cruise around the atoll in a catamaran or visit the beachfront spa, which boasts four unique couples’ treatment nests. The Zen restaurant invites just 12 guests a night to feast on the finest sushi and sashimi – make sure you reserve a spot here at least once. Choose from even more incredible paradise hotels like these with our tailor-made Indian Ocean holidays. To plan your dream trip, make an appointment in-store to talk to one of our Experts.